GRC athletes will take national-class competition to the brink of exhaustion this weekend in Chicago and at home. Karl Dusen, wearing bib #290, is going for his second-straight U.S. Olympic Trials qualifier at the Bank of America Chicago Marathon--the race where he qualified for the 2008 trials. Meanwhile, the women's team gets together for the first time at the Army Ten Miler, and will be joined by a few men who just can't stay away from the race course. "Karl is absolutely ready to go," GRC Coach Jerry Alexander said. "His workouts have been phenomenal, jaw-dropping stuff and his is sharp as a tack." 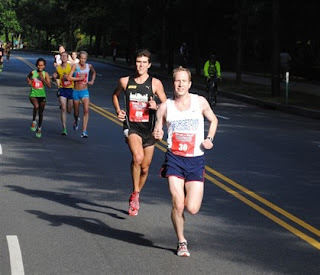 Dusen, who ran 2:20:35 in 2006 at Chicago, is coming off a summer of solid training and racing, which included a half marathon PR at the Rock 'n Roll Philadelphia Half Marathon -- 66:52 -- while measuring his effort with the windy city in mind. To show he wasn't all endurance, he ran 4:19 for the last 1600 of a workout in a steady rain last Wednesday. "He's tapered and ready to roll, and now it's go time," Alexander said. "The qualification standard is more than 90 seconds faster than his PR, so it's not going to be easy, but I believe he will get the job done." Meanwhile, the strongest GRC women's team to compete is assembling for the Army Ten Miler. Anna "Usain" Holt, Laura O'Hara, Kate Dart and Susan Hendrick will take on the annual rite of mid-October in the DC area. "Anna will be in uncharted territory, as she's never raced longer than 10k, but she's in great shape and will be ready to lead the charge for GRC," Alexander said. 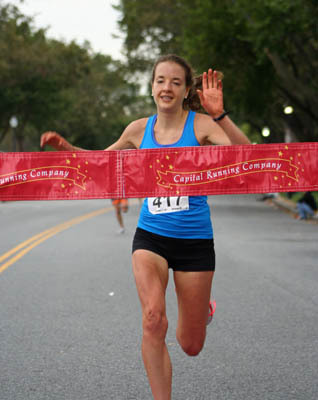 "Laura ran very well at the Great Race two weeks ago and is ready to take another step in her return to PR shape. Kate had an excellent performance at the Philly half and is poised for a major breakthrough at 10 miles. Susan has been a little dinged up the last couple of weeks but had a solid week of injury-free training and is ready to run well in her first serious race of the season. Danielle Siebert will also make her fall racing debut. The men will also sport a team on Sunday, but it is one largely in transition to racing, with Sam Luff and Jerry Greenlaw sharpening up for 10ks in November and December. Dangerous Dave Wertz will be the one to watch, though it would be hard not to, considering his bright orange attire. "He has made huge breakthroughs in the last year at 5k, 8k and 10k but his 10 mile PR is comparatively soft, and he's in great shape, so I expect a big PR from Dave," Alexander said. Jason Myers will also don his singlet so bright he has no chance of being hit by a car at night. Scott Koonce is also running Army for GRC and looks to improve on his Cherry Blossom mark and possibly PR in the process. Charlie Ban will open the weekend at the Anthem Great Pumpkin 5k in Reston Saturday morning. Others will meet at 9 am at the Georgetown store for a shop run. Perhaps those not racing Sunday can also meet in Georgetown to start a long run that will coincide with the Army 10 course so we can cheer on the competitors. Comment if you are interested in doing that. Nice article. I will be at the Store on Saturday morning for 10 miles or so. I'm going to run from the store Saturday too. Jake, can I catch a ride with you down to the store on Saturday morning? Yes, but can you get to my place? I'll drive you from here. I am in for store run saturday. anyone down for 15 or so on sat and get the long run out of the way? Jake, cool! should I get to your parking lot by 08:20 or earlier? Joe, I planning for 15 on Sat. Frank - 8:20 is good. I will email you my address. Sam or I will be driving us. Joe - I will run 15 on Saturday. I suggest an hour loop then tacking on.